Darren Naish: Tetrapod Zoology: British big cats: how good, or bad, is the evidence? "It is the best zoological blog out there, period"
British big cats: how good, or bad, is the evidence? The motto for my blog posts may become ‘better late than never’, as I planned to write the following some weeks ago. I don’t really have time to do it, but seeing as I feel good about getting some ‘work’ finished (my review of Tidwell & Carpenter’s Thunder-Lizards volume) I may as well get it over and done with. Plus I don’t feel like doing any more proper work anyway. More on the systematics and historical taxonomy of obscure British dinosaurs? Ugh. More on that in future here, anyway. As someone trying to gain a reputation as a credible scientist, it is not in my interest to declare my fascination with ABCs and related subjects. This is generally regarded, especially in academic circles, as a crackpot area inhabited only by the lunatic fringe. Unfortunately this stigma – accentuated by the half-serious, sensationalised way the subject is treated by journalists – has tarnished what is actually a perfectly sensible area for which good scientific data exists. When analysed by qualified scientists (whether they be field ecologists, laboratory-based specialists, or image analysts, or whatever), the results have been mostly positive. I start my talks on this subject by emphasizing that I do not ‘believe’ in ABCs (meaning that I do not accept their reality without question, as this is what is meant by the term ‘believe’ – see Arment (2004) for more on that if you’re interested). Furthermore, I have tried my best to maintain an appropriately sceptical approach. Like any scientist approaching a problem, I have come to the conclusions that I have because that is where the evidence has led me. And having become acquainted with the large amount of data, I have a dilemma. On the one hand I feel that the data is so compelling that we should accept ABC reality without question, and proceed with the realisation that ABCs are undoubtedly genuine. But on the other hand I feel that more, and better, evidence is required for us to be so confident. Let me make this clear: the evidence is outstanding, and none of the doubts expressed about this subject have any standing. It’s often said that, if ABCs are real, then why don’t we have good photos, why don’t we have dead bodies, why don’t we have captured live animals, and why don’t we have definitive track and sign evidence? Well, the news is that we do have good photos, we do have dead bodies, we do have captured live animals, and we do have definitive track and sign evidence. This data is out there for anyone that’s prepared to examine it. Why isn’t this more widely known? That’s the mystery. The negative stigma attached to the subject seems to mean that the good data doesn’t really get out, at least to those people who haven’t gone to the trouble of immersing themselves in the subject. Before I continue I should add that Britain only has, officially, two native felids: Scottish wildcats F. silvestris and Kellas cats. There is considerable disagreement as to whether the former should be kept as a distinct species: if Scottish wildcats are conspecific with the domestic cat F. catus, then African wild cats F. lybica and Indian desert cats F. ornata should be too – they’re even closer to F. catus, and indeed F. lybica is probably ancestral to domestics. Indeed it is even doubted by some as to whether purebred wildcats exist in Britain anymore. Others, however, regard it as useful to keep F. silvestris as distinct (see French et al. 1988, Daniels et al. 1998, Kitchener 1998, Reig et al. 2001, Pierpaoli et al. 2003). Kellas cats, only discovered in 1984, are introgressive domestic cat x wildcat hybrids that appear to be evolving their own unique behaviour and morphology and, by inference, into a new species (Shuker 1990). On to the ABC evidence itself, firstly, there are hairs, tracks and droppings that have been conclusively identified by experts as having come from non-native felids. Cat hairs recovered from a site in Lincolnshire in 2003 were confirmed by a government-accredited laboratory as having come from a member of the genus Panthera. Droppings collected in 1993 from Whorlton, County Durham, were identified by Hans Kruuk as from a Puma Puma concolor. This is a big deal because Kruuk is a world authority on the field biology and ecology of carnivorans, and he’s otherwise been openly sceptical of the existence of ABCs. Finally, a large number of trackways from various locations across the UK seem to be big cat tracks. That is, they possess the diagnostic features seen in cat tracks, but not in those of dogs and other carnivorans. It is, however, admittedly difficult to be really sure on tracks, and many of the alleged ABC tracks that I’ve seen – while probably produced by cats – leave room for doubt. It is well known that huge number of livestock kills have been blamed on ABCs. It’s often said that the way an animal has been killed – the apparent ‘neatness’ of the wound and resulting feeding sign, and the fact that the animal seems to have been killed by an attack to the throat – is indicative of a big cat as killer. This might be valid, but it’s very difficult to be confident about, so I hesitate in regarding livestock kills as that informative. There is, however, one specific case that stands out head and shoulders above the others: the Cupar roe deer carcass. There is so much that could be said about this case that I can’t cover it here (go here for more info). There is no doubt in my mind that this animal was killed by a big cat, and it was found (by Ralph Barnett, a journalist with no prior interest in the ABC phenomenon) on a small country road in Scotland. Similarly compelling are dead bodies. Yes, dead bodies of British ABCs. Multiple specimens are now known from the UK, and they show that several species of exotic felids are (at least at times) abroad in the British countryside. They include several Jungle cats Felis chaus, five Leopard cats Prionailurus bengalensis, and a Eurasian lynx Lynx lynx, shot dead in East Sussex in 1991 (Shuker 1995). The lynx is particularly interesting as the case was pretty much kept quiet until 2001. I don’t hold much faith in conspiracy theories, but the farmer who shot this animal was told by the police to keep it to himself. In fact it’s not difficult to think that, if any official body (say, the police, or the government) does know that ABCs are an undoubted reality, they will likely not want this to become widely known. Two live exotic felids have been captured in Britain: a puma called Felicity, and a lynx called Lara. Both animals have been regarded as escapees from private collections, but this is missing the point given that surely all British ABCs are escapees from private collections (read on). Finally, an increasing number of still photos and sequences of video footage are definitive and clearly show British ABCs. They also depict assorted species. 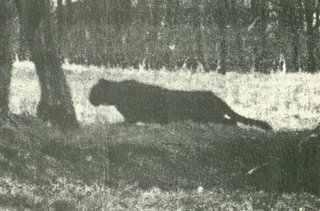 An excellent photo taken by Peter Nixon at County Durham in 1992 clearly shows a Jungle cat, a black leopard was photographed a few times as it ran across a hillside at Tonmawr, Wales, by Di Francis in 1982, and a large cat that is either a puma or black leopard was photographed in November 1988 by Tim Young at Zennor, Cornwall (this photo is on the cover of Nigel Brierley’s They Stalk By Night). My favourite images come from a short sequence of video footage filmed at Great Witley, Worcestershire, by Nick Morris in May 1992 (a still from this sequence is shown above). The animal is a black leopard (though this is only really clear when the original colour footage is viewed). There are other bits of excellent, definitive photographic evidence – those I’ve mentioned are my favourite ones. So what does all this mean? The conclusion is that the evidence for the presence of exotic felids in the British countryside is overwhelmingly good, and it can’t seriously be doubted that the animals are here. The Cupar roe deer carcass, definitive hairs, droppings, outstanding photographic data, and dead bodies and captured animals, provide compelling data for the contention that ABCs are real. Notable efforts to find evidence that resulted in negative conclusions (Baker & Wilson 1995, Weidensaul 2002) did so because, I think, they didn’t look at enough data. This was particularly obvious in the case of Baker & Wilson’s study (produced for the Ministry of Agriculture Fisheries and Food) – they only looked at four pieces of photographic data, for example, and had a total budget for their study of £8200 (Moiser 2001). Exotic cats of several species are here, and in fact the term ABC is a misnomer, as a significant percentage of the animals are not big cats in the strict sense of the word, but members of various small cat lineages. I assume that, because these cats are rather larger than domestic cats, they are therefore assumed to be ‘big cats’. That goes even for Jungle cats, which are about a third bigger than a domestic moggie, but no where near the size of a puma or leopard. The great mystery I suppose is why these cats are here. They are not natives, and even though we now know that lynxes were here until about 1000 years ago, it is implausible that mammals this large could remain undetected in such small, crowded islands. They are escapees from collections, or animals that have been deliberately introduced. Can an exotic felid survive in the British countryside? Yes, without doubt. In fact a Clouded leopard Neofelis nebulosus that escaped from Howletts Zoo in 1975 survived for nine months in the wild until it was shot, and it was healthy and in good condition. Yet this is one of the most specialised, tropical cats of them all. I could go on but I need to stop there. Comments are welcome, and further points relative to this subject will be covered in future posts. And to those of you reading this that live in my area, do come along to my next talk and see the data for yourselves. And for the latest news on Tetrapod Zoology do go here. Arment, C. 2004. Cryptozoology: Science & Speculation. Coachwhip Publications (Landisville, Pennsylvania), pp. 393. Baker, S. J. & Wilson, C. J. 1995. The evidence for the presence of large exotic cats in the Bodmin area and their possible impact on livestock. ADAS, Ministry of Agriculture Fisheries and Food, pp. 16. Daniels, M. J., Balharry, D., Hirst, D., Kitchener, A. C. & Aspinall, R. J. 1998. Morphological and pelage characteristics of wild living cats in Scotland: implications for defining the ‘wildcat’. Journal of Zoology 244, 231-247. French, D. D., Corbett, L. K. & Easterbee, N. 1988. Morphological discriminants of Scottish wildcats (Felis silvestris), domestic cats (F. catus) and their hybrids. Journal of Zoology 214, 235-259. Kitchener, A. C. 1998. The Scottish wildcat – a cat with an identity crisis? British Wildlife 9, 232-242. Moiser, C. 2001. Mystery Cats of Devon and Cornwall. Bossiney Books (Launceston). Pierpaoli, M., Birò, Z. S., Herrman, M., Hupe, K., Fernandes, M., Ragni, B., Szemethy, L. & Randi, E. 2003. Genetic distinction of wildcat (Felis silvestris) populations in Europe, and hybridisation with domestic cats in Hungary. Molecular Ecology 12, 2585-2598. Reig, S., Daniels, M. J. & Macdonald, D. W. 2001. Craniometric differentiation within wild-living cats in Scotland using 3D morphometrics. Journal of Zoology 253, 121-132. Shuker, K. P. N. 1990. The Kellas cat: reviewing an enigma. Cryptozoology 9, 26-40. - . 1995. British mystery cats – the bodies of evidence. Fortean Studies 2, 143-152. Weidensaul, S. 2002. The Ghost With Trembling Wings. North Point Press (New York), pp. 341. Considering that pumas survive in the chapparral desert of the Santa Monica mountains in the middle of LA, I don't doubt they could survive in rural Britain. Taxonomically, though, I believe pumas are technically small cats ... just very big ones ... are they not? Thanks for the comments. If you know anything about the adaptability of cats (and especially that of species like pumas and leopards), then, yeah, survival in Britain would be no trouble at all. Where do pumas go in cat phylogeny? This is mildly controversial: the influential DNA studies of S. J. O'Brien and colleagues found pumas and cheetahs to form a clade that was at the base of Felidae, and thus well away from the clade that included Panthera. However, the latest studies (see Bininda-Emonds et al. 1999) show that extant cats really do break down into distinct 'small' and 'big' cat clades, with pumas and cheetahs being at the base of the 'big' clade. complete phylogeny of the extant Carnivora (Mammalia). Biological Reviews 74, 143-175. Flynn, J. J., J. A. Finarelli, S. Zehr, J. Hsu, & M. A. Nedbal. 2005. Molecular phylogeny of the Carnivoria (Mammalia): Assessing the impact of increased sampling on resolving enigmatic relationships. Systematic Biology 54(2):317-337. Think of pumas and cheetahs as early model big cats in which the ability to roar has not appeared. Where resident ABCs are concerned; the matter may not be settled until regularly used lairing sites are discovered. Locations where generations of ABCs have been born and raised. Either that, or long term studies of local populations over the course of generations. When you've got three, four generations of native born leopards on record,it gets a tad hard to deny they exist. Well, at least it's not cryptozoology. ;-)> We get reports of Mountain Lion (Felis concolor) here in New York all the time, but if any are true at all, they must be escapees, as in your country. In all the years of record keeping, we've never had one shot or found as a road kill. The road kill evidence is critical to me. When Fisher (Martes pennenti) started to expand their range out of the Adirondack mountains into suburban backyards in the Mohawk Valley, I noted their diagnostic track patterns but didn't start thinking of them as a viable population until I started noticing the occasional road kill. In Florida, where there seem to be less than 100 "panthers" (non-mountain lions -felis concolor - if you will) no less then 7 individuals have still managed to become road kill in the last 5 years. Of course Americans are hell-bent drivers anyway, perhaps the British are different. Just a perspective from the US. Interesting post as always, although I think I might find " the systematics and historical taxonomy of obscure British dinosaurs" interesting too. But then that's just me. Alien big cats normally survive by stealing human beds for purposes of Repose and Comfort. Such alien big cats resent comments that their parents were strangers to the marital state. We have been researching bigcats In Australia for several years now wih the intention of writing a book on the subject. The problem is compounded here by monster felis cattus that have been shot/videotaped/photographed. We had to get dna off a tail to confirm it was from a monster feral cat. I wrote to you several times on your university email but we never received a reply so I assume you were not interested. Mike: I most certainly am interested, I have simply been very busy. I've also lost your email, so please contact me again. I'm very excited about the evidence for giant feral cats in Australia: I'm familiar with it and have seen two pieces of video footage (one of which shows a 'normal' moggie and a huge black one in close proximity). Paul Cropper showed the films at a recent meeting I attended. I am intending to blog on this subject at some stage, and I'd be interested in any news on the subject. I'd like to talk to you about the significance of the DNA evidence. "I'm very excited about the evidence for giant feral cats in Australia"
Hi Darren, I teied the only email account I could find listed to you..but no luck. I returned your email twice from my yowies@gmail.com account. They didnt appear to bounce...but the emails both appear to have gone into the ether.. Some of your readers might be interested in the streaming video interview of Kurt Engel who shot the monster feral in east gippsland in 2005.
sorry about the multiple posts. I was trying to do something and didnt think it was actually posting ..alas I fear it was. Also, I am missing some footage for my documentary and I wonder if you can point me in the correct direction. I need some video footage of a melanistic leopard. Can you recommend any sources? Filmed a monster feral cat last night in OZ. Will be posting up different sequences in the next few days. I'm glad to see someone with a legitimate academic background interested in these topics. Cryptozoology seems to be dominated by armchair zoologists and random whacko's who simply aren't qualified to evaluate their own claims. My first encounter with British ABC's was a fictional example in the children's book Olga Da Polga, when I was about 8. The book is written from the perspective of a pet guinea pig or hamster who finds herself stalked by the infamous "Surrey Panther." Presumably the book was written after a spate of ABC sightings in the 60's or 70's. I remember thinking "Surrey? isn't that in England? gee, I didn't know England had native species of panther..." And the topic has interested me since. Could this have been an inspiration for Doyle's Hound of the Baskervilles? I am surprised at the quality of evidence you cite. As an American, I have always heard this topic regarded with snickers and bad jokes. The only evidence I have ever seen mentioned on US television was a home video showing a small cat stalking through high grass at the edge of some trees. It had a bob tail and faun-like markings, with white spots on a brown coat. Were it not for the markings and with little to reference for scale, I might have thought it to be an overweight Manx, but as it walked one could see considerable musculature which you don't see in domestic cats. It actually resembled an American bobcat, except for the spots. Was this one of the jungle cats you mention? I don't question that Britain could hypothetically support a small population of these predators. Here in the States we have mountain lions in California (rarely seen until they ambush joggers), Florida panthers in Florida (so endangered that they are often born with malformed gonads due to inbreeding), and bobcats and lynxes scattered elsewhere. In north Alabama where I live, the range of coyotes has shifted to include us in the last few decades. Many books will say we have none, and yet I have seen them on multiple occasions in my neighborhood, both singly and in packs, sometimes crossing my own street at night, silent as ghosts. Sometimes I can hear them "yip" in the distance. This is not a rural area and I wouldn't have thought we have enough fauna to support a pack of midsize predators, but here they are, caring little for their supposed range. Maybe they're eating all the armadillo that aren't supposed to live here, yet are often seen as roadkill. From the evidence you've presented, I think the real question should no longer be "do ABC's exist?" but rather "are they a breeding population? are they a handful of distinct species or are some interbreeding and creating fertile hybrids?" btw, I have never heard of "F. cattus." Is F. domesticus considered deprecated nowadays? Thanks for your comment B. Kelly. I also read Olga Da Polga as a child (Olga was a guinea-pig, and the 'Surrey puma' that haunted her back garden turned out to be Noel, the domestic cat). Conan-Doyle is said to have been inspired (for 'Hound of the Baskervilles') by the ghostly hounds found in British folklore, not by big cat sightings. You're right that the evidence for British mystery cats is way, way better than typically acknowledged or recognised and it is a perpetual frustration that little of the data gets reported in the scientific literature. Anecdotal evidence suggests that some of our cats are breeding, but we need better data for this. And - finally - domestic cats are Felis catus, not F. domesticus. Thanks for your comment and keep an eye on Tet Zoo ver 2 where, right now in March 2008, I am still very much involved in British big cat research. Go here. Darren Naish is a science writer, technical editor and palaeozoologist (affiliated with the University of Southampton, UK). He mostly works on Cretaceous dinosaurs and pterosaurs but has an avid interest in all things tetrapod. His publications can be downloaded at darrennaish.wordpress.com. He has been blogging at Tetrapod Zoology since 2006. YOU ARE CURRENTLY AT A VERY OLD VERSION OF TET ZOO: for modern articles, go to: http://blogs.scientificamerican.com/tetrapod-zoology/ And check out the Tet Zoo podcast at tetzoo.com! Many thanks to those who have donated!